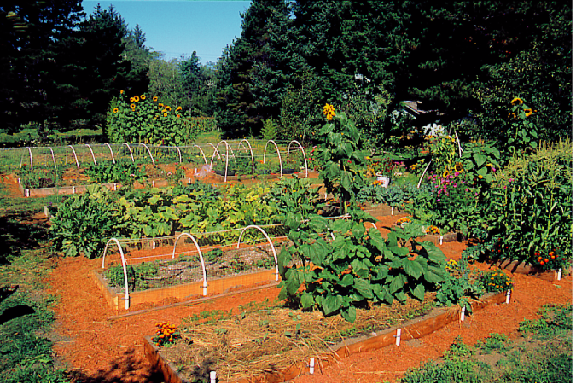 Your raised beds beat mine! I’m going to have to do a lot of work before getting my precious little seedlings in the ground. Eddy, you are building your own house. If anything, I ought to be aspiring to do what YOU are doing. 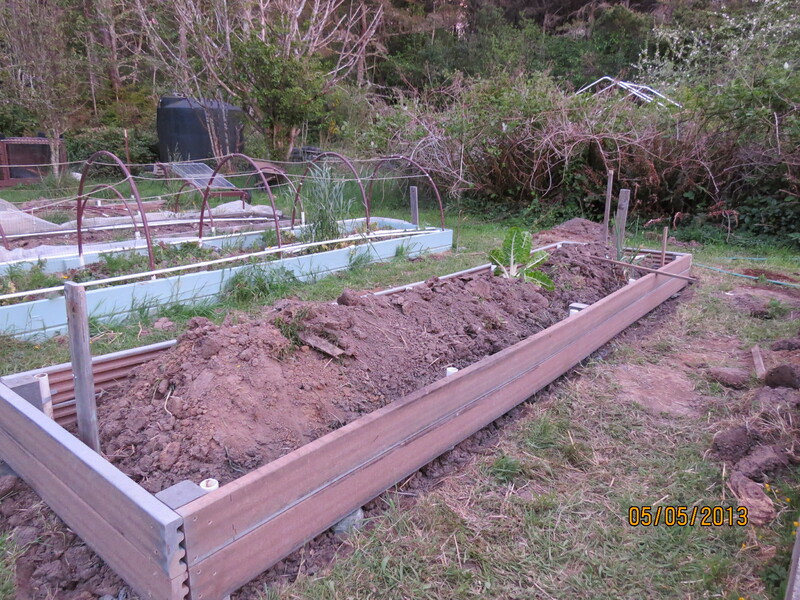 I really enjoyed seeing how things aged with your raised beds and where you are now. You’ve done a marvelous job! Thanks…you can see I’ve got my work cut out for me. When I fired up my old Troy-bilt rototiller after 4 or 5 years of not using it we both had an idea…take out some of those really rotten beds and use the tiller again. btw, it started on the second pull. I bought it in 1975…IT’S 37 YEARS OLD. Oh, I get it, completely! We started out wanting to absolutely everything by hand, but we’ve had to invest in some tools that make use of fuel for really hard jobs. We realized that we’d never battle through acres of bush and thorn trees without the help of a motorized bush cutter this year, and bit the bullet. I’m so impressed at your tiller starting up like that after years of disuse – what a nice surprise! 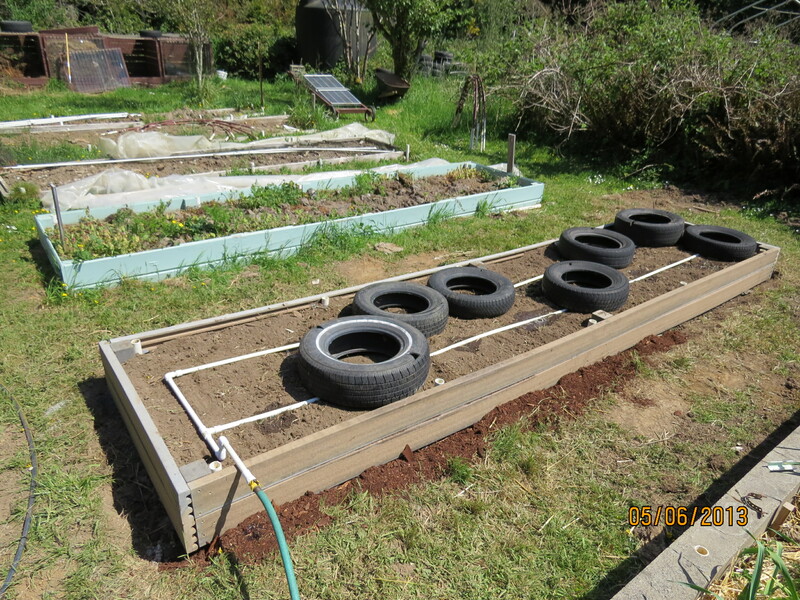 Could you explain the use of tyres in the bed. Do they remain there permanently? The tires are used to extend the day’s ‘warmth’ into the evening…something you probably don’t have to worry about in Australia. On the Oregon Coast (north of California) the temps in the day are 55 to 65 F tops (12-18 C)…the night temps can dip to as low as 45 F (7 C). I’ve grown tomatoes like this for over 30 years. This year I’m using fewer tires (tyres) because of the moles. Since I’ve been gardening here so long, the moles have established tunnels. 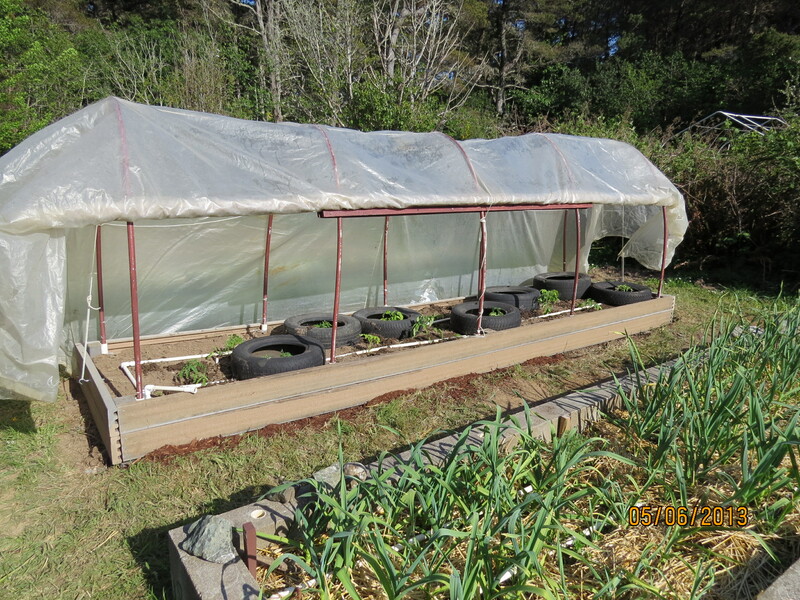 Every year, no matter which beds I have the tomatoes in, they (moles) will burrow tunnels down the line of plants. 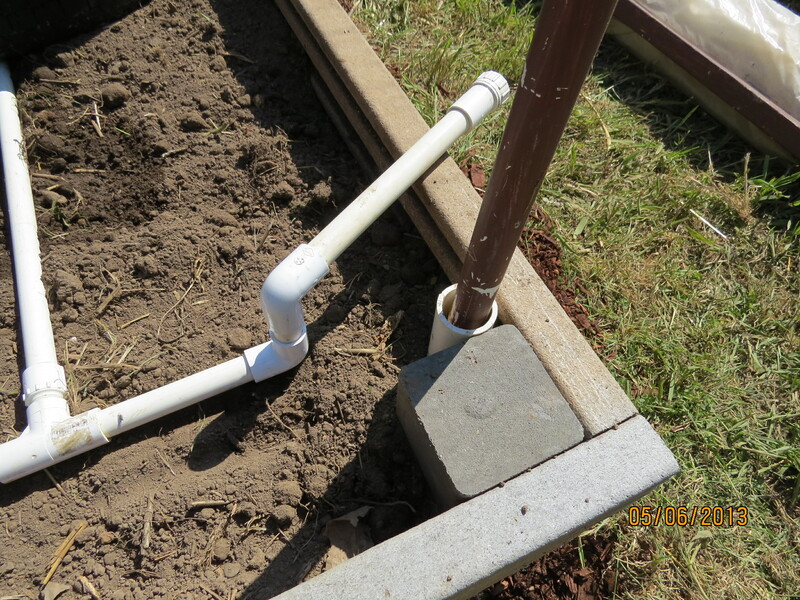 The tunnels bring air pockets to the plants’ roots and one sunny day, all the plants will look like they’re dying. 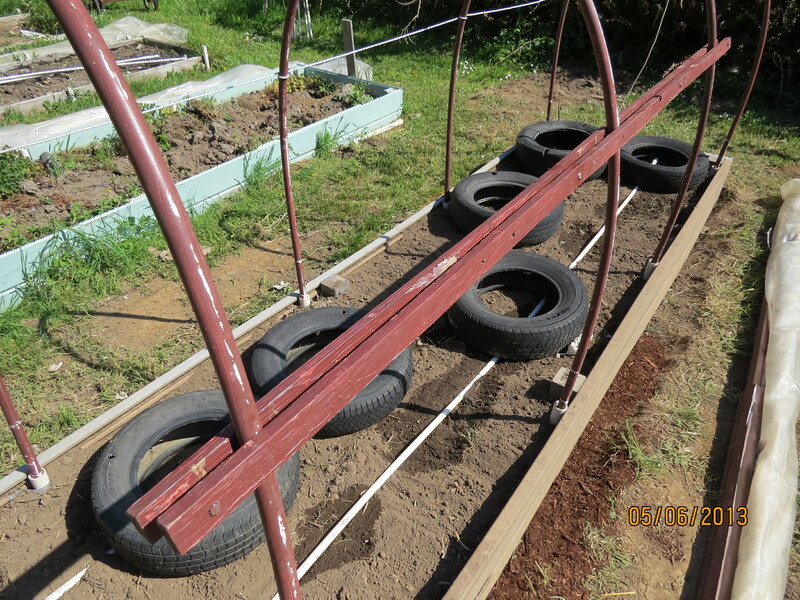 Then I’ll have to take a stick (or an ell shaped rebar) and cave in the tunnels…it’s easier without so many tires.